Every time I try a Saveur recipe, I think, “Maybe I can survive the disappearance of Gourmet.” For this year’s Thanksgiving, I made two recipes from the magazine: this one and the one for Cornbread-Sausage Stuffing. Both deserves repeated revisits. The cranberry sauce took me to entirely new places that no cranberry sauce had done before. It has something to do with the cardamon and olive oil, I’m sure. Heat oven to 450. Using a peeler remove peel from 1 orange, taking off as little of the white pith as possible. Cut peel into very thin strips, about 1 1/2″ long. Squeeze juice over orange, strain and reserve 1 tablespoon juice. In a bowl, combine peel, 1 pound fresh or thawed cranberries, 1 cup sugar, 2 tablespoons extra-virgin olive oil, 1 teaspoon kosher salt, 4 smashed green cardamon pods, 4 whole cloves, 2 sticks cinnamon, and 1 small stemmed and thinly sliced jalapeño. Toss and transfer to a parchment [or aluminum foil] lined baking sheet. Roast until cranberries begin to burst and release their juices, about 15 minutes [or less, if using a convection oven]. 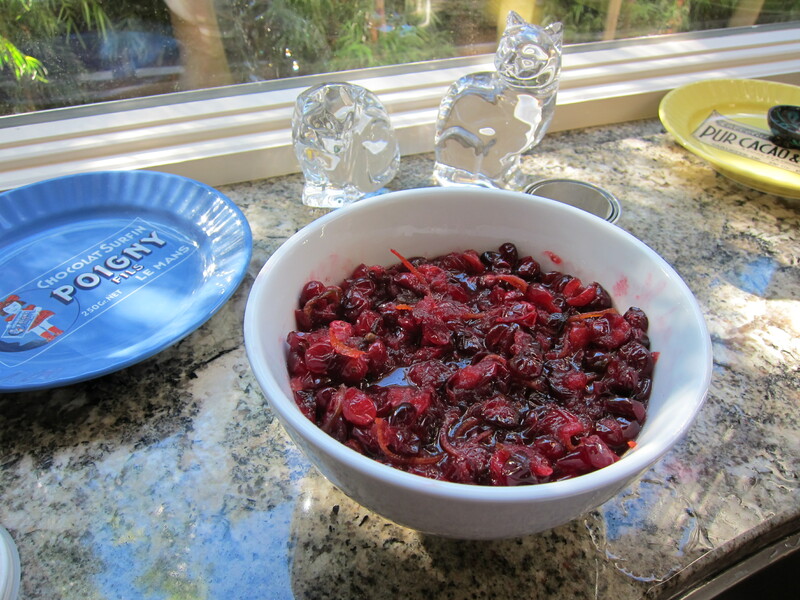 Transfer cranberry mixture to a bowl; stir in reserved orange juice and 1 1/2 tablespoons port. Let sit for at least 1 hour so that the flavors meld. Remove and discard caradmon, cloves, and cinnamon before serving. Makes 2 cups.